If an insect is carrying a virus or other disease, it can transmit it to humans and animals through saliva when it bites or through its feces. Insects that carry diseases are called vectors and are more common in less developed countries. Controlling insect population around humans and animals helps to reduce the transmission of disease. Use building materials that are pest-proof, eliminate pest food sources and use physical traps or poison. Fleas may carry Murine typhus and bubonic plague. People living in the western and southwestern United States are at the highest danger of contracting bubonic plague from fleas. In addition, fleas may carry filarial worms or heartworms that infest dogs and tape worms that attack cats, dogs and occasionally humans. Fleas are wingless insects that feed on blood and most commonly infest domestic dogs and cats. To control flea infestation, it is important to treat all animals and their indoor and outdoor environments simultaneously. 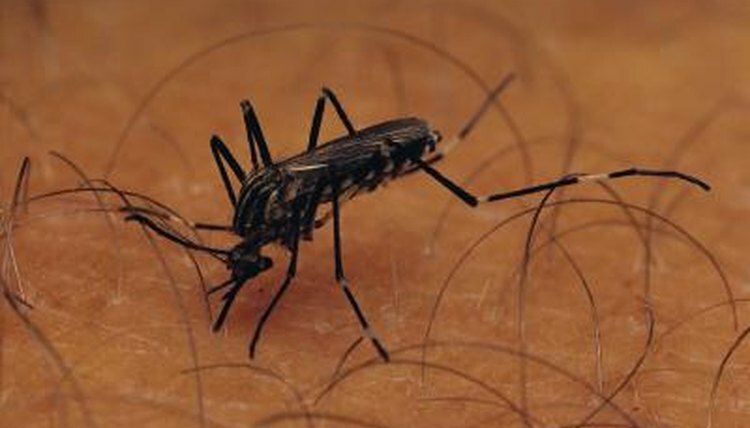 Mosquitoes have been vectors of malaria and yellow fever for thousands of years. Today, they are known for carrying Lyme disease and West Nile virus to both humans and animals. In addition, humans are at risk of contracting St. Louis encephalitis, and horses may contract eastern equine encephalitis. In the United States, organized pest control has managed the mosquito population and minimized the risk of spreading disease from mosquitoes. Other control measures include regular cleaning of pools, birdbaths and other water containers, and minimizing stagnant, dirty water. In addition, using bug repellent will help deter existing mosquitoes. Some flies, including common houseflies and sand flies, do not bite. However, their presence may be a sign of uncleanliness. Although it does not bite, the housefly is still a disease vector for bacteria such as Shigella spp., which causes dysentary; Salmonella spp., which causes typhoid fever; Vibrio cholera, which causes cholera and traveler's diarrhea. These bacteria are transmitted when the fly regurgitates into human food while the fly is eating. Good sanitation and disposing of food waste are effective ways to control fly population around humans. Tsetse flies are vectors of sleeping sickness or African Trypanosomiasis. Ticks feed on blood and may be vectors of diseases including tularemia, Lyme disease and Rocky Mountain spotted fever. Ticks do not fly or jump; rather they climb onto grasses or branches and attach themselves to a host that walks by. Check yourself, your children and your pets for ticks and promptly remove them. In addition, use a tick or insect repellent, and treat your pets with a collar or topical tick-and-flea treatment. Conenose bugs, also referred to as kissing bugs, are vectors for American Trypanosomiasis or Chagas' disease. Although kissing bugs do bite, this protozoan disease is transmitted by contact with the bugs' feces. Keep kissing bugs away from you and your pets by sealing gaps around doors, around windows and between the living area and the attic. Keep pets indoors at night and keep all pet areas clean. If you suspect an infestation, contact a pest control operator to apply a chemical insecticide.